As probably most of you might know, I am a die-hard coffee nerd/addict. I do admit that I’m pretty spoiled by the coffee culture as I’m coming from New York City, I have access to a lot of very good to excellent coffee shops here. When I was planning my trip to Chicago, I was mildly freaking out thinking there might be a lack of my essential need in the morning. I don’t want my travel companion to face the ugly side of me when I don’t have any caffeine in my system. 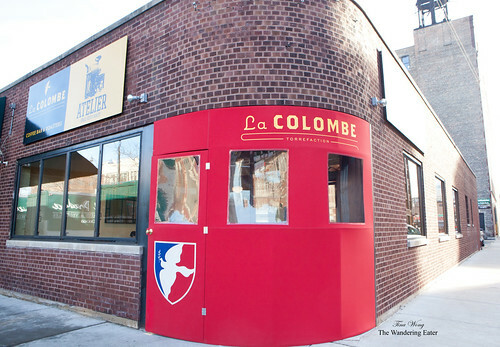 But, the great news was that there is a La Colombe Torrefaction in Chicago. 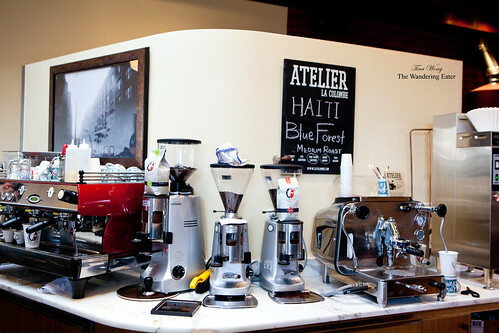 La Colombe Torrefaction is Philadelphia’s renowned artisanal coffee roaster, started by Todd Carmichael and Jean Philippe Iberti. 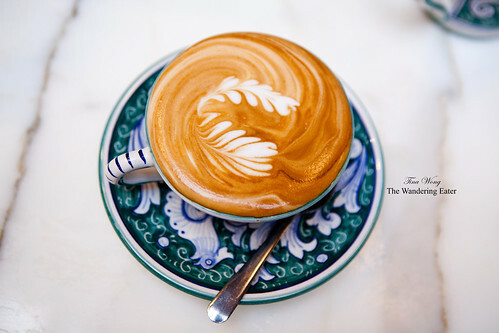 It has expanded around the U.S. to a total of three cafes in New York City, two Philadelphia, one in Chicago, and one, interestingly enough, in Seoul, South Korea. 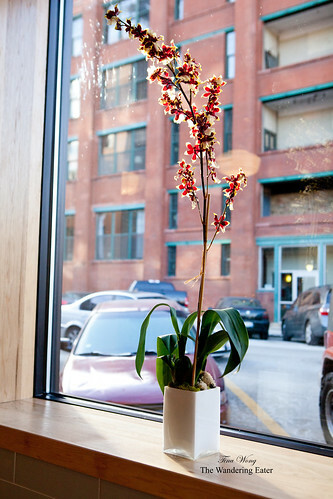 Chicago’s location is very different than all their New York shops. It’s much larger, open, airier and thank goodness it doesn’t feel like a forum of Apple laptops where everyone is just staring at their screens while sipping their well made cups of cappuccino. 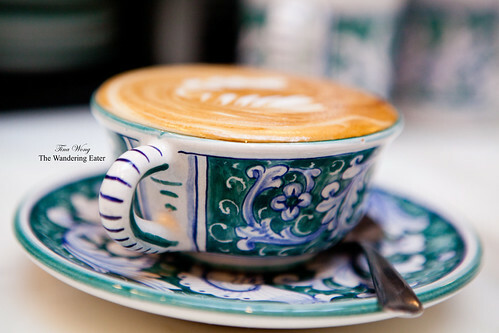 (If you have been to New York that certain coffee shop, you know what I’m talking about.) 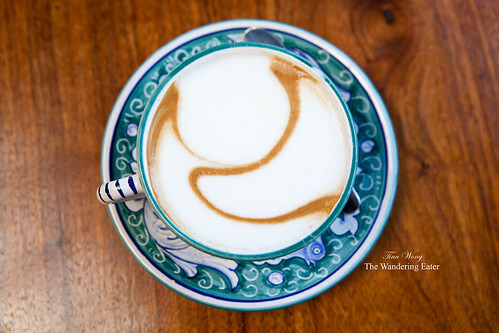 It’s simply a place where you can just sit down and enjoy your coffee and possibly one of their locally made pastries. 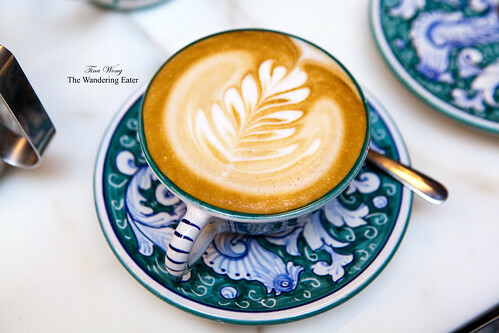 When My friend and I had our first rounds of cappuccinos, these were amazing. It’s quite different than the cappuccinos I’ve had from the La Colombes in NYC. I found it so much more creamier, slightly sweeter and satisfying. I’ve spoken to one of the managing staff members, Corey and found out it was really because of the milk they’ve used. I noticed the baristas here kept shaking the milk bottles they’re about to pour out. That’s because it’s unhomogenized organic milk from a farm in Michigan. 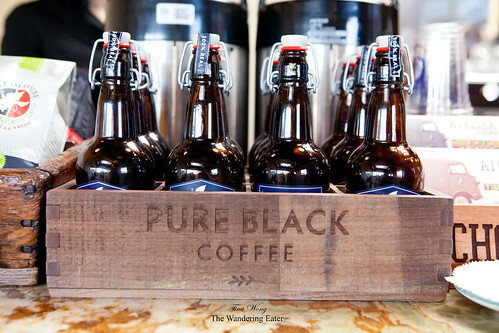 One of their newest product that was released mid-August – and probably my lifesaver for my trip – is the Pure Black Coffee ($4.50 per bottle). 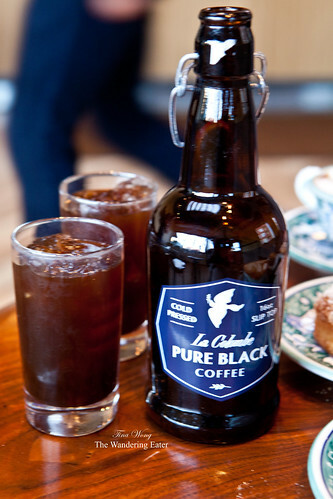 This is the cold-brewed coffee of your dreams. It’s potent, as they steep their Corsica blend in stainless steel beer tanks for 16 hours then pressed and filtered twice, and not diluted, but it’s very smooth. When you take a sip of this on the rocks, it’s like a unsweetened coffee syrup that has a flavorful profile of wonderful dark cocoa with a hint of smoke. I picked up another bottle so I can refuel myself for the next morning. 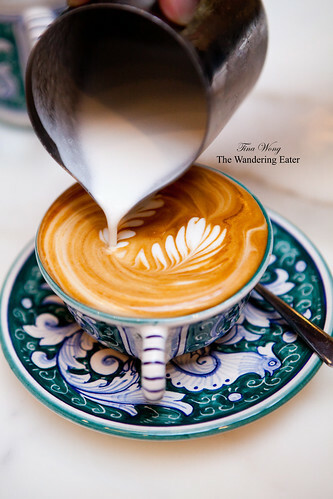 I’ve watched the skillful baristas behind the coffee bar, making a number of cappuccinos with their beautiful latte art (and I’ve drank a lot of them, too). I’m astounded by how they poured this particular one seen above, the double feather. 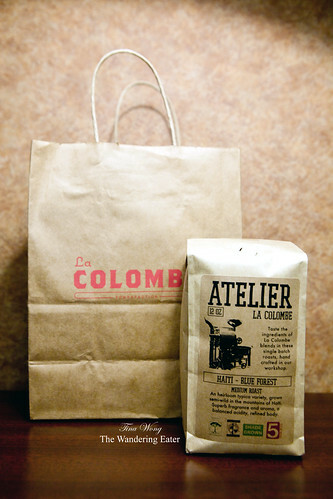 La Colombe also source from two local bakeries their delectable pastries. The square-shaped blueberry bread I had was quite delicious. The fluffy, fine crumb with a good ratio of moist blueberries. 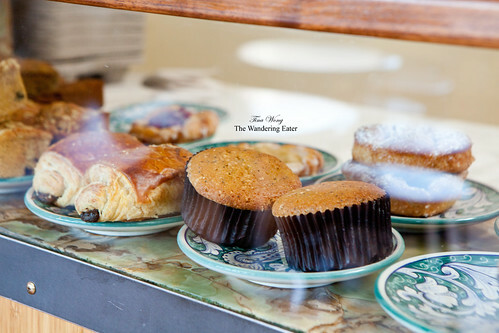 The laminated pastries (e.g. 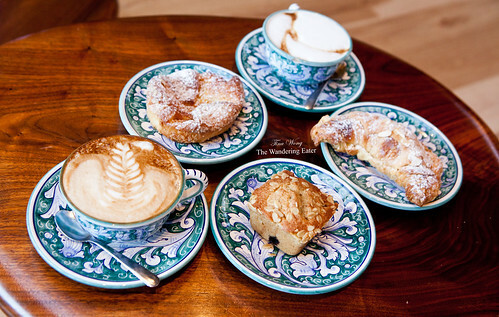 croissants and puff pastries) were from a different source that are delicious. Flaky, not too sweet and it works wonderfully with the expertly made cups of coffee. The awesome part of this tour, so to speak, was to see the beautiful vintage espresso machine. 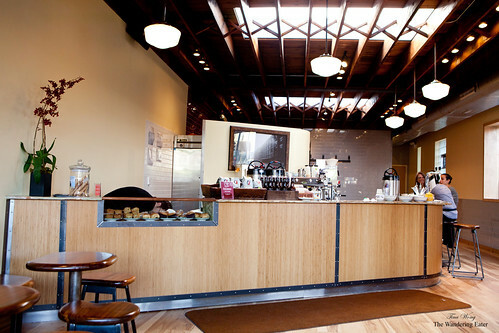 Basically, they’ve restored and revamped this beauty into a modern working espresso machine. 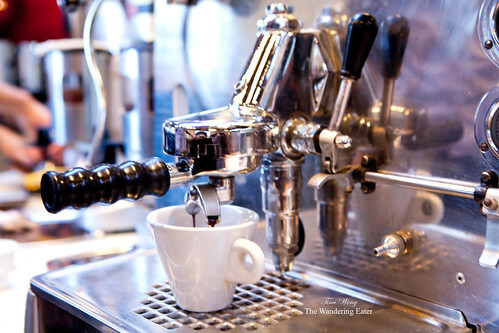 There’s a subtle difference of the resulting espresso from this machine compared to the La Marzocco where the baristas tend to pull their espresso for cappuccinos and lattes. Before we left, I also gotten their bag of exclusive Blue Forest coffee beans that were freshly roasted two days ago. These beans are very unique because there’s practically no other roaster grows and utilizes Haitian coffee beans except for La Colombe Torrefaction. The beans are grown semi-wild in the mountains of Haiti. It’s carefully monitored by their few members of team from growing to harvesting and shipping over back to the States. When I brewed a cup of this at home (it’s best brewed either by espresso or French press), it was really good. It reminds me of Ethiopian coffee but not exactly. Soft and mellow in the beginning but the light fruitiness lingers and expands on the palate. If you’re around Chicago and in the need of well made coffee near the Loop, I’d suggest you to head over to La Colombe Torrefaction.